← #117 – More history …. and games with the dog! My recent posts have had a bit of a history bias, which is no bad thing – a day in the hills sometimes comes alive when there’s a tale to be told. 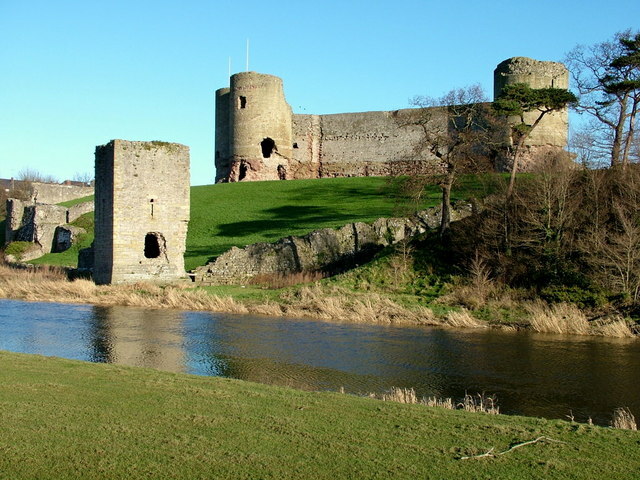 Living in North Wales means that there is no shortage of stories, and we are surrounded by history – the slopes running down to our house once had an Iron Age hill-fort on the summit (see post #73), and at nearby Rhuddlan the English king Edward I signed the document that provided the constitutional basis for English rule in Wales. 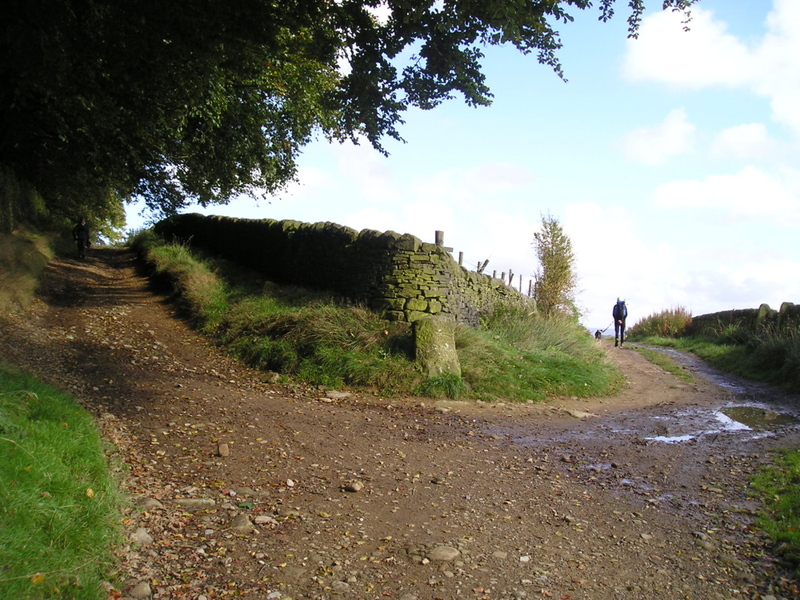 Walking in West Yorkshire – lanes and tracks …. Walks in the mountain areas of Britain such as Wales, tend to go along the lines of “Walk up something big and steep, walk around a bit (sometimes with great views) then walk down something big and steep”. In West Yorkshire the walking tends to be a bit more subtle than that. There will be ups, and downs to follow, but they tend not to be as big as in the mountains – what a walk doesn’t lack, however, is history. 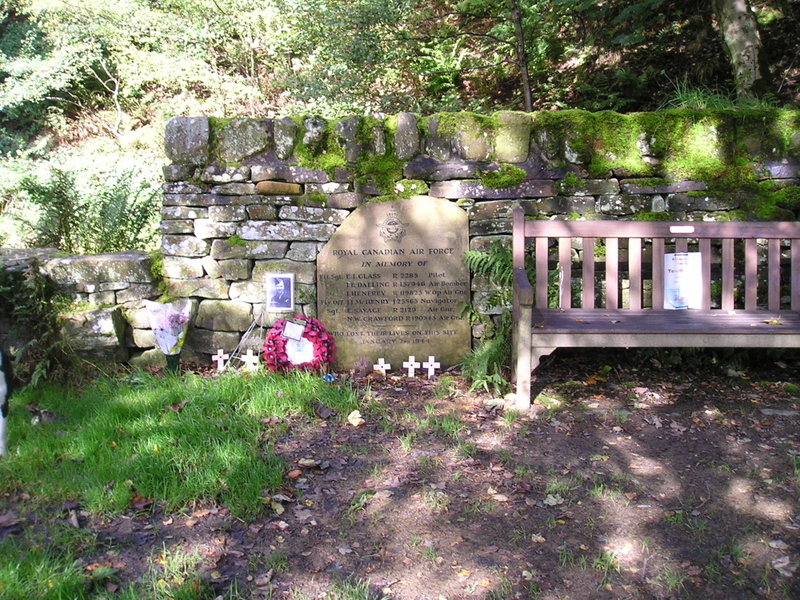 The Wellington bomber, serial number BK387, crashed into the hillside at Tewitt Hall wood on 2nd January 1944. The aircraft had taken off from Ossington near Newark at 8pm, on what should have been a four-hour training flight. 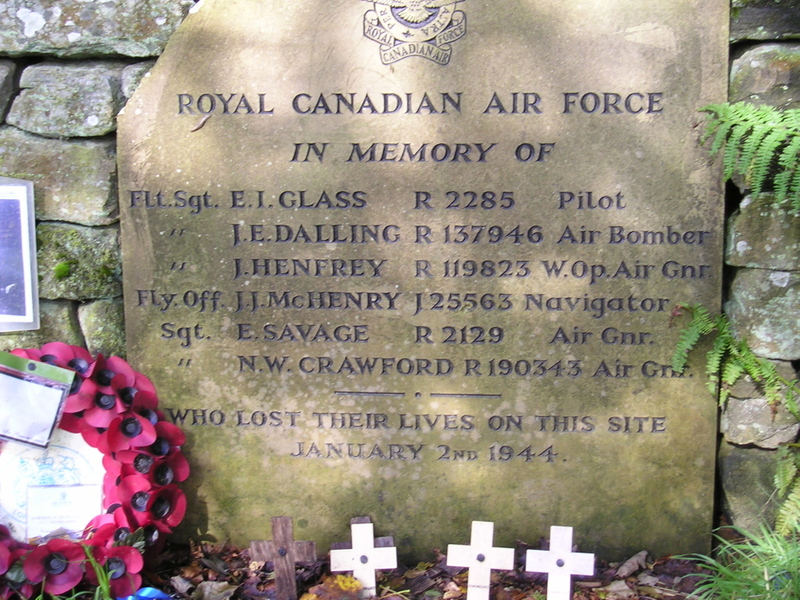 The crew, all Canadian airmen, were killed in the crash, and are buried at Stonefall Cemetery, Harrogate – they are remembered each year in a service that takes place at the crash site. 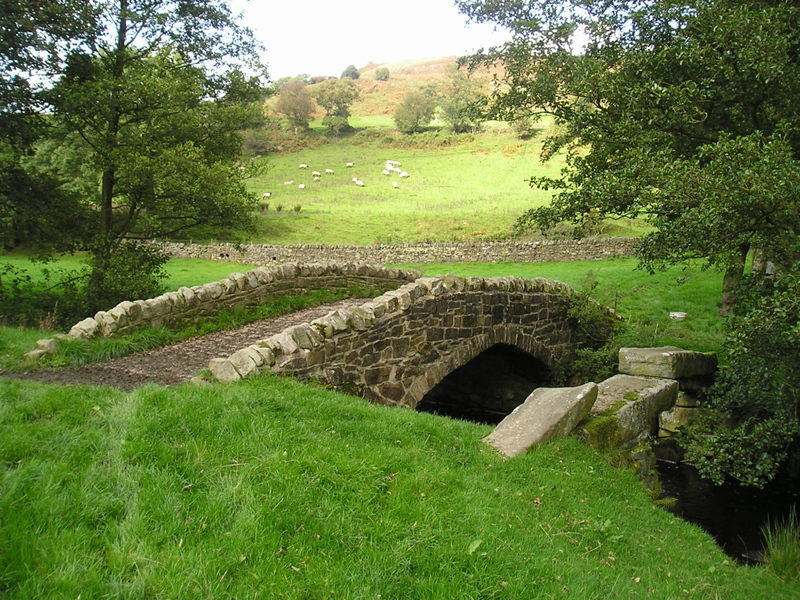 Another view of the old bridge …. 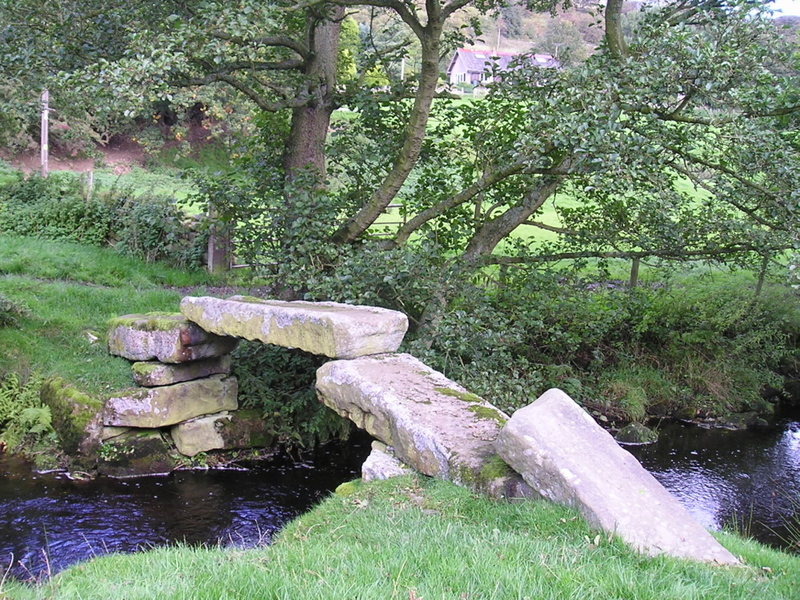 Two miles beyond the crash-site is something from an earlier age – an ancient pack-horse bridge at Newsholme Dean. Before the advent of canals and railways, the main form of transport for goods was by horse, and you don’t have to look far to find the relics left behind. This particular one is a personal favourite, if only for the way it seems to defy gravity! Less than a mile away is the village of Goose Eye. 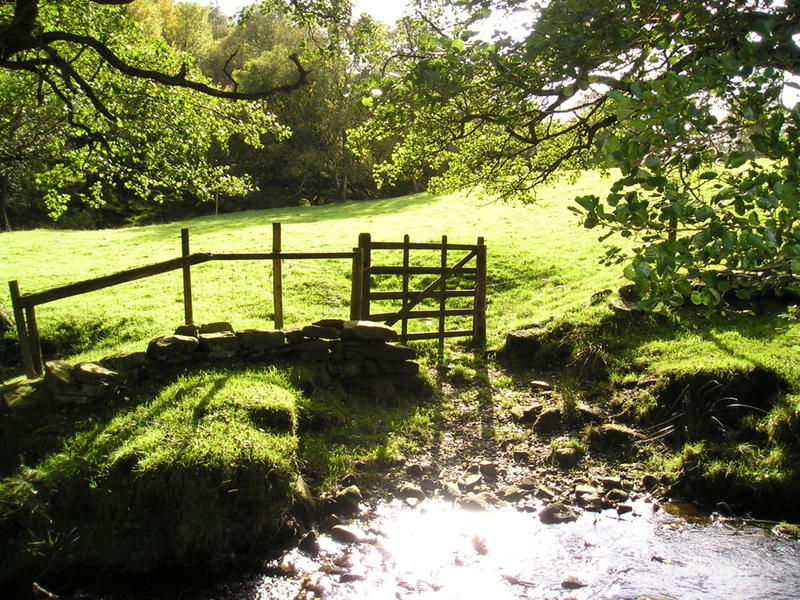 The curious name may date back to the visit by the Ordnance Survey team in the 1850’s – the surveyors usually asked the locals what names they used for places, and in the local dialect Ea means ‘near a stream’. It’s quite likely that some of the more outlandish names on maps in the UK were probably the result of the locals having a laugh at the surveyors’ expense! Goose Eye expanded from a tiny hamlet when a woollen mill was built by the stream. Known as the Turkey Mill, this later became a paper mill, producing the paper on which the Indian Rupee was printed. 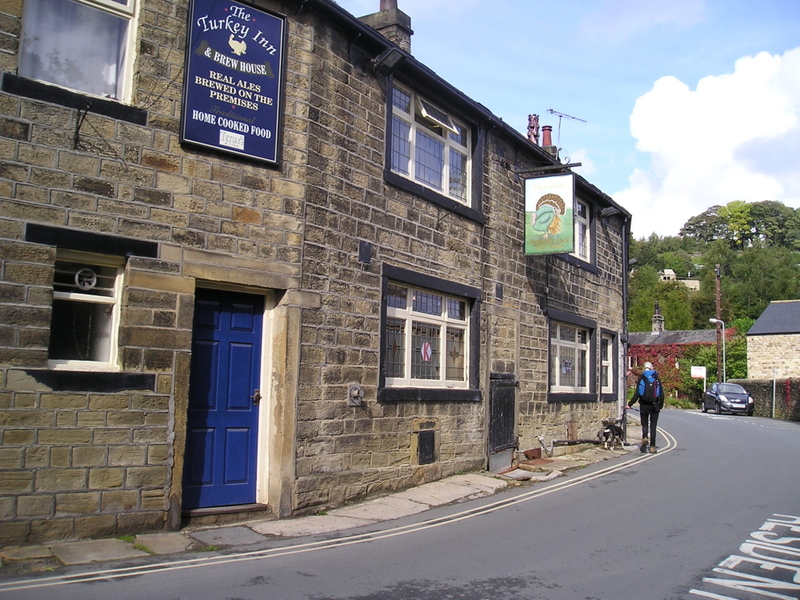 Thirsty mill workers provided custom for a pub, and the Turkey Inn still survives, with its own brewery attached. 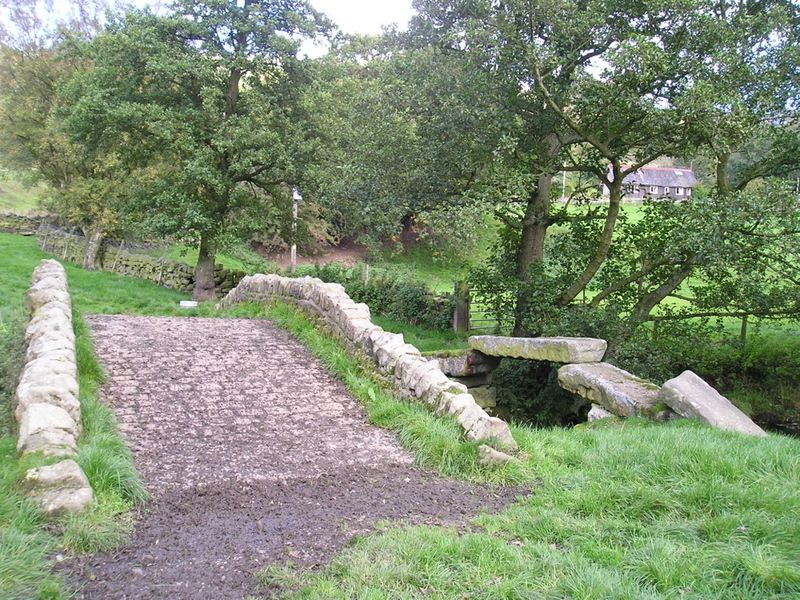 The Haworth walk took us back towards the start point via a stream crossing at Lower Slippery Ford – a name like that is enough to put Chris off at the best of times, but her fears were groundless on this occasion. 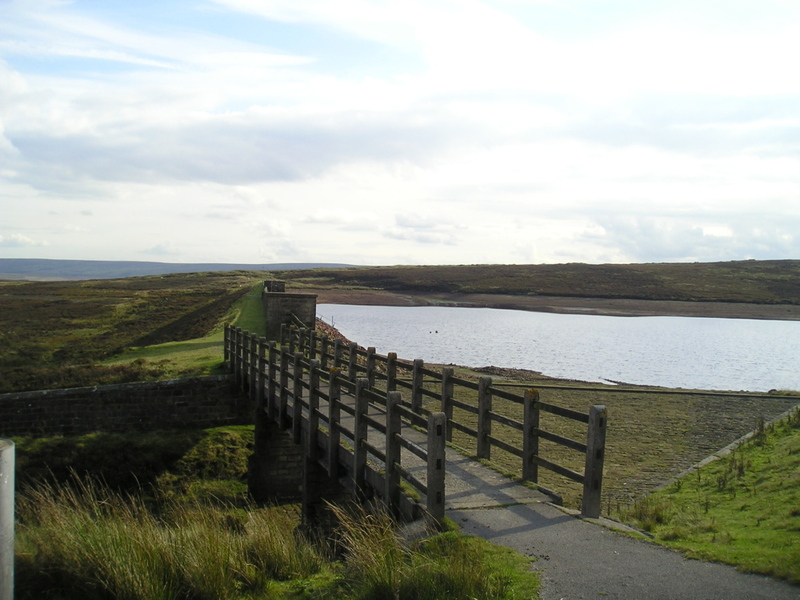 Our return route took in Keighley Moor Reservoir, one of the oldest reservoirs in the area. The “Big Dam”, as it was called, was completed in 1832 to control the water for the mills downstream. 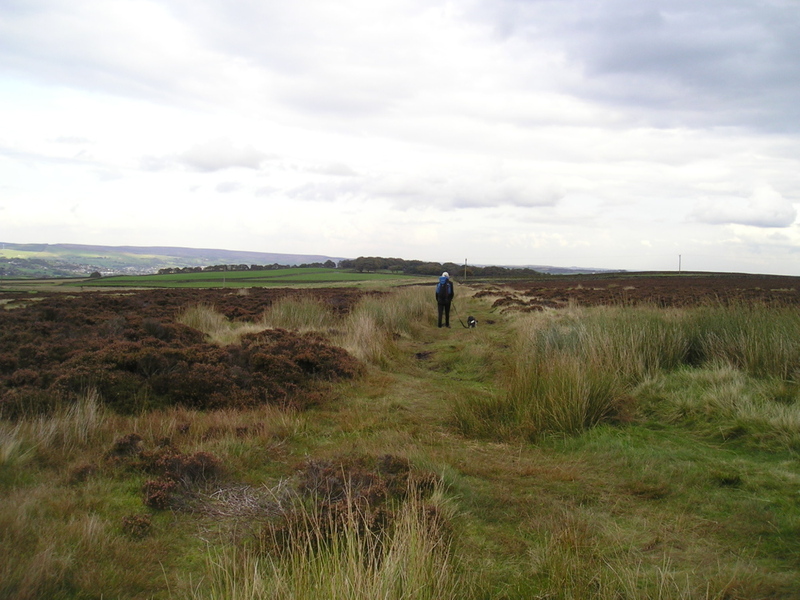 Our day ended with the crossing of Oakworth Moor heading back towards Haworth. The moors of West Yorkshire can’t compete with the mountain areas for spectacle and grandeur, but they have more than enough hidden history to fill a day. Text and images © Paul Shorrock, except the image by George Tod © which is taken from the Geograph Project and reproduced here under a Creative Commons Licence. I've been mucking about in the mountains for longer than I care to mention. I started out by walking my local hills, then went on to rock climbing, mountaineering and skiing. Still doing it, and still getting a buzz. I'm now sharing the fun, through my guided walking business (Hillcraft Guided Walking) and by writing routes for other publishers, mainly Walking World and Discovery Walking Guides. Just to make sure I keep really busy, I am also currently a member of my local mountain rescue team. This entry was posted in 4. 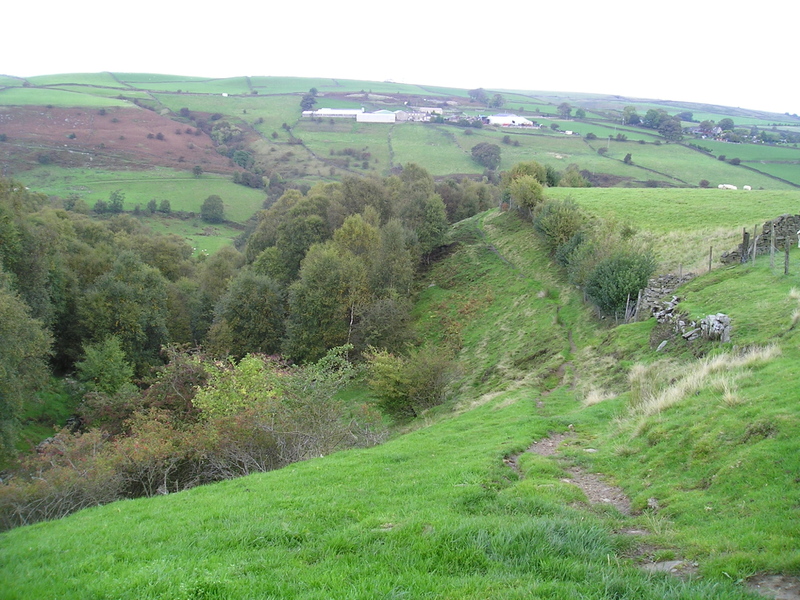 Northern England and tagged hillwalking, photography, Yorkshire. Bookmark the permalink. Interesting about the Ordnance Survey story. I’ve long thought Ramsbottom was an odd name for a place. But there are indeed plenty of odd named places about. There’s plenty o’ folks around here called Ramsbottom too! Hi Paul, looks like an enjoyable ramble through some pretty tasty countryside. I agree with your sentiment about the history of a place adding another layer to the walk. For me, it’s all about finding the little hamlets and villages along the way (usually ending in the pub!) and the people that you meet as well. Nowt wrong with a gentle amble rather than a steep hill for a change. I confess I’m woefully unaware of the pleasures of Yorkshire – a disgraceful statement to have to make. I love that cantilever-style bridge. I just wonder whether it has an advisory weight limit….! Or perhaps the dreaded Health and Safety haven’t penetrated West Yorkshire yet. That bridge looks incredibly precarious, but it must have been there for a couple of centuries or more – excellent engineering! Definitely no need to be apologetic about the lower level walks – it’s the variety that counts, and you are certainly dishing up plenty of that (though I might baulk if the next one is through a housing estate). That is a crazy bridge – a local giant obviously threw down those stones in a rather casual manner. Chris refused to walk over the bridge, but it’s absolutely solid, a bit like the Cantilever Stone on Glyder Fach. Interesting post. I thought I knew this area well (my sister used to live there) but you have been to places and told stories that I had never heard of! Hi, and hanks for reading and leaving a comment. I really don’t know this area very well, maybe because I ‘learnt’ most of my way around the Dales by walking with the caving club when it was raining – no caves = crap walk. But you have proved this wrong. 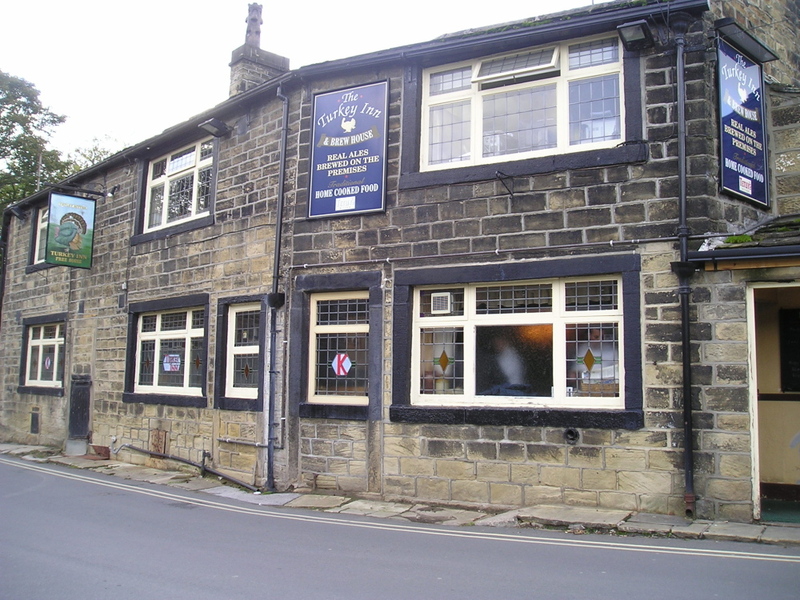 I have been to the pub at Goose Eye once or twice although I can’t remember when as it was a long time ago. It is also funny how many airmen are buried at Stonefell Cemetery – my father-in-law is buried there and when we visit I am struck by the number of serviceman crosses – some from the Vietnamese conflict too. So much history in Britain, keep it up – this is a superb post Paul. Thanks for that SP – when I decided on the subject I had you in mind, with your Canadian connection and your liking of history – glad you enjoyed it! Like you, I never used to walk much in Yorkshire – it was either the mountains of the Lakes, Snowdonia, etc or caving in the Dales. When I met Chris in 1998 she lived in Yorkshire, and she got me started in walking there – before that I knew the Three Peaks and the routes to various caves, but nothing else. Great area round there Paul, I just love it! It’s funny, but since we moved to Wales I quite miss the hills of Yorkshire. No regrets though, with some of the best mountains in the UK a short drive down the road from us.